Does tax time typically mean a windfall from Uncle Sam for you? The average tax refund is over $3,000.00, which, for many homeowners, makes April and May home improvement time. But don’t sign the paperwork for that granite counter top or start digging out your garden just yet. There’s a new type of home improvement in town. It’s something you can use every day, it adds value to your home, and users report that it saves them time, money, and stress. .
Smart home technology—once a futuristic dream, now an affordable reality—is one of the hottest home improvements you can currently make, and a very smart way to spend your refund. 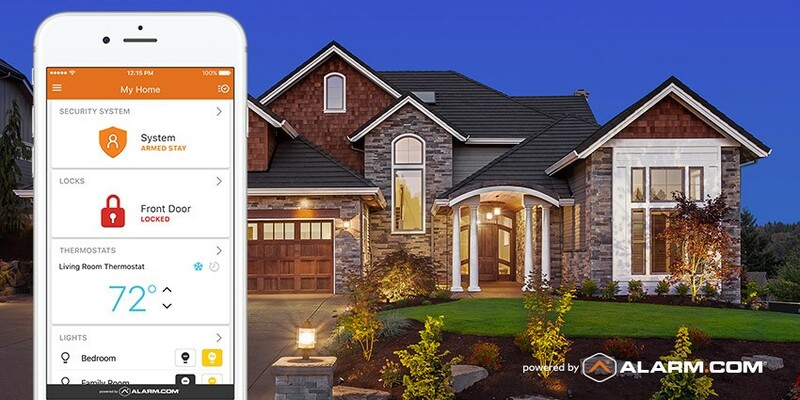 In fact, when you take the smartest route of all—the Sentry Security powered by Alarm.com route—you can get a professionally installed smart home security system, with an array of smart devices, without even using your whole refund. Compared to an old-school alarm system, a smart security system is typically easier to use and far more convenient. You control everything through a smartphone app, so you can arm and disarm your system from your driveway, your office, or your bedside table. It can detect a break-in and alert your professional monitoring station even if the security panel is smashed or your phone line is cut. Even if this was all a smart security system did, it would still be worth having. After all, the average dollar value loss of a burglary is $2,300.00. However, a Sentry smart security system also gives you a comprehensive platform for a full smart home solution. Your security system can incorporate a huge range of smart devices: smart thermostats, connected video cameras, smart locks, a video doorbell, garage door openers, connected lighting and more. Sentry Security installs everything, your Alarm.com app controls everything, and your devices all work together. With a Sentry Security smart home, your state-of-the-art security system does come with a monthly payment. However, it also comes with a range of savings. For starters, many home insurers offer premium discounts for professionally monitored security systems. That’s because a good system that both deters and detects intruders means less risk to them. Meanwhile, your new smart thermostat will help you save money by saving energy when you don’t need it. You don’t have to fuss with day-to-day settings, because it works with the security system and can save energy automatically when you leave home, or even when the back door is left open. Other smart home savings are harder to put a dollar value on. If you’ve ever had to waste a vacation day letting a contractor into your house, you’ll appreciate the time savings of a smart lock. If you worry about your pets while you’re away on vacation, unique user codes for a pet-sitter and video monitoring can save you a lot of stress. Unlike, say, a bigger TV, professionally installed smart home technology is a lasting investment in your home, with realtors reporting that it can boost both curb appeal and property value when the time comes to move on. It won’t be long before this popular upgrade becomes a must-have item. To get the most longevity from your investment, it’s important to buy technology in which the smart home platform is front and center, rather than an afterthought. A strong platform like Sentry Security gives your system a long life with regular updates and new features. Could you get these benefits by buying individual smart home and home security products off the shelf and piecing together your own system? It would be just about possible… with enormous effort, a high level of technical know-how, and a lot of warm-weather Saturdays spent tinkering and troubleshooting. With Sentry Security, you don’t need to worry about that. We come to your home and do the installation and setup for you. Later on, if you have a problem, we can fix it, either remotely or with a return visit to your home. CLICK HERE to connect with Sentry Security – an Alarm.com service provider. EXCEPTIONAL Post.thanks for share..more delay. Great post. I’m facing a couple of these difficulties. Hi , I do consider this is a superior blog. I stumbled upon it on Yahoo , I’ll return once again. Great information. Lucky me I reach on your own site by accident, I bookmarked it.